NASA's Earth-observing "eyes in the sky," including Earthorbiting satellites, aircraft, and the International Space Station, provided detailed images of the flooding and devastation in areas affected by Hurricanes Katrina and Rita. NASA, along with academic institutions and partner agencies, worked to ensure that the Department of Homeland Security and the Federal Emergency Management Agency had the best available information to aid the rescue and recovery effort. The images and associated data helped characterize the extent of the flooding, the damage to homes, businesses, and infrastructure, and the potential hazards caused by the storms and their aftermath. NASA used its Experimental Advanced Airborne Research Light Detection and Ranging system, carried aboard a Cessna 310 aircraft, to survey the Gulf of Mexico coastline. The system can "see" through vegetation, like trees and shrubs, to view the land underneath. Near the coast, it mapped the beach surface under water. This helped the U.S. Geological Survey, the Federal Emergency Management Agency, and the Army Corps of Engineers determine the state of the shoreline infrastructure, identify hazards, and study environmental loss. The left photo is a mosaic of images taken of New Orleans by NASA's Terra satellite in April and September 2000. The right photo, taken by the same spacecraft, shows New Orleans on September 15, 2005, with flooding caused by Hurricane Katrina. The flooded parts of the city appear dark blue, such as the golf course in the northeast corner, where there is standing water. Areas that have dried out appear light blue gray, such as the city park in the left middle. On the left side of the image, the failed 17th Street canal marks a sharp boundary between flooded city to the east, and dry land to the west. Throughout the hurricane season, NASA observed the upper ocean thermal conditions in the Gulf of Mexico. Research shows a link between the intensification of hurricanes in the region and oceanic heat content. In late August 2005, when Katrina passed over the Loop Current and a large warm eddies called the core ocean ring, it evolved quickly from a category 3 to category 5 hurricane in only nine hours. The warm waters of the Loop Current appear to have rapidly fueled the storm while the warm core rings seemed to have sustained the storm's intensity. NASA and the National Oceanic and Atmospheric Administration (NOAA) are studying this phenomenon to confirm if oceanic heat content plays a major role in hurricane intensity. Researchers use satellite altimetry data, including data from NASA's TOPEX/Poseidon and Jason-1 missions, to calculate in near-real time the tropical cyclone heat potential, a measure of the vertical temperature of the upper ocean. Satellite altimeters also search for warm pockets of water in the ocean that could fuel a passing tropical storm or hurricane. The Loop Current has warmer waters at greater depth than the surrounding ocean, as well as different salinity. These differences create variations in the sea surface height that can be detected from space and incorporated into the study. This year NASA conducted the Tropical Cloud Systems and Processes mission, designed to study the factors that influence the genesis and rapid intensification of tropical cyclones. During the Costa Rica-based mission, scientists tracked two major Atlantic Ocean hurricanes at the height of their destructive power, witnessed the entire lifecycle of tropical storms in the Atlantic, and documented a number of unexpected surprises about the short, violent lives of these seagoing tempests. The mission documented "cyclogenesis," the mysterious formula of rainfall, air and sea temperature, pressure, and other factors required to spawn tropical storm systems. By studying the complex processes that form tropical storms, scientists will gain a better understanding of how hurricanes evolve, intensify, and travel-the key to developing earlier, more accurate warning systems. Partnering with NOAA and the Costa Rican Centro Nacional de Alta Tecnologia, NASA spent July conducting ground-based and airborne studies of tropical storm systems on Costa Rica's east and west coasts. The team primarily intended to investigate the birthplace of eastern Pacific tropical cyclones, which they did in detail, but an early start to a record-breaking, busy Atlantic hurricane season added numerous other research opportunities to the mission. The missions used NASA and NOAA aircraft, satellites, balloon-borne weather probes, and remotely operated aircraft to investigate the lifecycle of Hurricane Dennis, from genesis through post-landfall, a disturbed region of the Eastern Pacific that likely gave birth to Tropical Storm Eugene, and the complete lifecycle, from genesis to landfall, of Hurricane Gert. These data sets represent the first time that anyone has sampled the full life cycle of a single tropical cyclone. Scientists will collate and analyze the enormous amount of data for more than a year. The Aerosonde remote-controlled aircraft is released from its transport truck on the runway at NASA's Wallops Flight Facility, Wallops Island, Virginia. It was sent down the coast to fly through Hurricane Ophelia, a low-energy hurricane. While satellites searched for warm water in the Gulf from space, NASA also took a closer look at the environment where the atmosphere meets the sea, the critical zone where the ocean's warm water transfers energy to a growing storm. On September 16, 2005, NASA, NOAA, and Aerosonde North America launched a remote-controlled aircraft into Hurricane Ophelia as it sat off the coast of Georgia and the Carolinas. The aircraft, known as an Aerosonde, was equipped with sophisticated instruments that recorded temperature, pressure, humidity, and wind speed in real time and relayed the information back to the researchers. The resulting data provided the first-ever detailed observations of the high-wind area where a hurricane meets the sea surface, an area often too dangerous for piloted aircraft to observe directly. 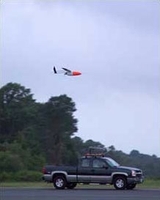 NASA pioneered the use of aerosondes in other tropical convection experiments in 2001 and 2005, but this was the first time the Aerosonde flew into a hurricane. The Aerosonde, along with piloted aircraft and Earthobserving satellites, are helping scientists and forecasters better predict hurricane intensity and behavior. Enhancing this predictive capability would save the United States billions of dollars, and-more importantly-save lives. This year, NASA scientists learned more about forces that continually change Earth's shape. 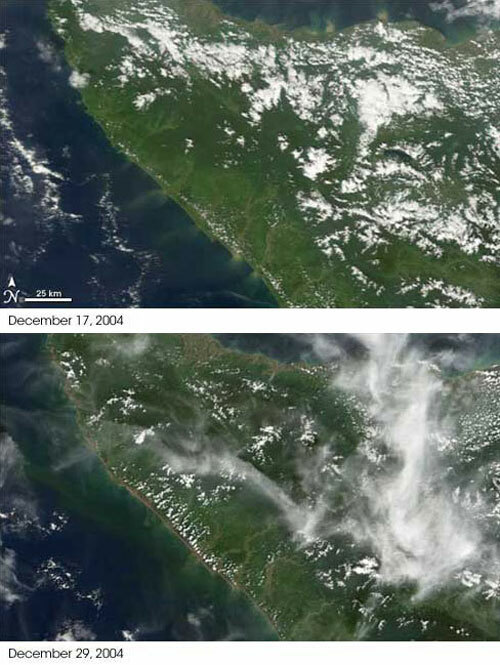 Single events like the Indonesian earthquake in December 2004, and seasonal climate events like El Nino, can cause measurable changes in the Earth system. The massive earthquake off the west coast of Indonesia on December 26, 2004, registered a magnitude of nine on the new "moment" scale (a modified Richter scale) that indicates the size of earthquakes. It was the fourth largest earthquake in one hundred years and the largest since the 1964 Prince William Sound, Alaska earthquake. In addition to the massive tsunami that washed over 10 countries in South Asia and East Africa, NASA found that the earthquake caused permanent changes to the Earth's structure. Using Earth observations from before and after the Indonesian earthquake, NASA scientists calculated that it slightly changed the planet's shape; the Earth's oblateness (flattening on the top and bulging at the equator) decreased by a small amount and the North Pole shifted by about 2.5 centimeters. The earthquake also increased the Earth's rotation and decreased the length of day by 2.68 microseconds. Physically, this is like a spinning skater drawing their arms closer to the body resulting in a faster spin. Scientists using NASA satellite data found that Earth's shape also appears to be influenced by climate events like the El Nino Southern Oscillation and Pacific Decadal Oscillation that affect the amount of water moving in the oceans, atmosphere, and continents. The study results showed that significant variations in Earth's shape over the past 28 years might be linked to climate events. Space may look empty, but it is filled with dust, debris, and dynamic forces generated by the Sun, including radiation hazardous to astronauts and satellites. On January 20, 2005, the space around Earth was filled with radiation when a large solar flare blasted out the most intense burst of solar radiation in five decades. Normally, it takes two or more hours after a flare on the Sun for the blast of solar radiation to reach maximum intensity at Earth. In January, the solar protons released by a massive flare-accelerated to nearly light speed by the explosion-reached Earth and the Moon only minutes later, beginning a days-long "proton storm" that altered existing theories about the origin of proton storms around Earth. "Since about 1990, we've believed that proton storms at Earth are caused by shock waves in the inner solar system as coronal mass ejections plow through interplanetary space," said Robert Lin of the University of California at Berkeley, principal investigator for the Reuven Ramaty High Energy Solar Spectroscopic Imager (also known as RHESSI). "But the protons from this event may have come from the Sun itself." No one suffered from the January 20th solar event thanks to the thick atmosphere and magnetic field that protect Earth and its inhabitants from solar radiation. However, high-energy protons ionized the upper atmosphere, disrupting electrical devices and communication signals. Astronauts on the International Space Station were safe, as well, since the Station is heavily shielded and orbits inside Earth's magnetic field. The Moon, however, is totally exposed to solar flares. It has no atmosphere or magnetic field to deflect radiation, so protons rushing at the Moon simply hit the surface. An astronaut caught on the Moon's surface when the storm hit may have gotten sick and exhibited symptoms of radiation sickness: vomiting, fatigue, and low blood counts. Solar radiation storms hitting the Moon also would affect exploration vehicles, like robotic explorers. Therefore, to protect astronauts and space vehicles on the way to the Moon or on the surface, NASA and its partners are developing technologies that can predict solar flares, coronal mass ejections, and geospace storms, part of what is called "space weather." The Transition Region and Coronal Explorer (TRACE), the Advanced Composition Explorer (ACE), the Solar and Heliospheric Observatory (SOHO), Wind, and the RHESSI spacecrafts are the space community's early warning system, spotting solar activity before it reaches Earth and helping scientists to identify the causes of flares and coronal mass ejections. The result is improved forecasting, better solar fl are prediction, improved planning and better shielding from bursts that could disrupt radio transmissions, cellular communications, and satellite service. On July 4, 2005, NASA scientists created their own fireworks in the sky when part of NASA's Deep Impact spacecraft successfully crashed into a comet. The Deep Impact team members, located more than 83 million miles away at NASA's Jet Propulsion Laboratory, steered the spacecraft, comprised of a subcompact car- sized "flyby" spacecraft and a smaller, washing machine-sized "impactor," toward the comet, Tempel 1, for a first-of-its-kind, planned, high-speed collision with a comet. After a voyage of 172 days and 268 million miles, Deep Impact's collision with Tempel 1, a nomadic ball of dirty ice and rock orbiting between Mars and Jupiter, was a smashing success. The impact gave scientists a glimpse beneath the comet's surface, where material from the solar system's formation has sat relatively unchanged for billions of years. The 820-pound impactor collided with the comet nucleus at a speed of 23,000 miles per hour, spewing out a spray of vaporized impactor and comet material that glinted in the sunlight like a giant, distant firework-bright enough to be seen by telescopes on Earth. The Deep Impact science team theorizes that the impactor vaporized deep below the comet's surface when the two collided, creating a crater and revealing the untouched, primordial material beneath. By observing the impact crater and how it developed, scientists hope to learn the basic structure and density of the comet. 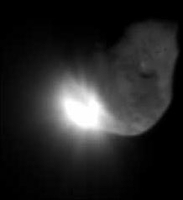 The final image from the short-lived impactor was transmitted three seconds before it met its fiery end from a distance of about 18.6 miles from the comet's surface, allowing scientists to resolve features on the comet's surface that are less than four meters across. The Deep Impact science team continues to probe the data collected during the Independence Day encounter, data that will provide new insight into comets. These beautiful, icy remnants of the ancient solar system provide clues to its formation and evolution and the role comets may have played in providing ancient Earth with water and other chemicals necessary for life. Since successfully completing their three-month primary missions in April 2004, the Mars Exploration Rovers, Spirit and Opportunity, have explored ever farther from their landing sites as they study Mars' geology. Both rovers have worked in the harsh Martian environment much longer than anticipated and are in amazingly good shape for their age. Their unanticipated longevity has allowed both rovers to reach destinations beyond the original scope of their missions and to keep making discoveries in pursuit of NASA's Vision for Space Exploration. NASA plans to keep both rovers exploring through September 2006, taking advantage of their excellent mechanical health. Autonomous operation, particularly on a planetary surface, is an important capability for future robotic exploration vehicles. Opportunity gave NASA scientists a chance to hone their creative skills when it unwittingly drove itself into a sand trap. Every effort to free itself worked Opportunity deeper into the soft sand until all six wheels were mired up to their rims. For five weeks, the rover team at the Jet Propulsion Laboratory planned their long- distance "roadside assistance," carefully devising and testing a strategy to extricate the rover from its trap. The team cheered on June 4 when Opportunity sent images indicating that it was back on firm ground-rolling free and ready to find more Martian marvels. On the morning of August 12, 2005, an Atlas V launch vehicle roared away from Cape Canaveral Air Force Station, Florida carrying NASA's two-ton Mars Reconnaissance Orbiter (also known as MRO) on its seven-month flight to Mars. Its ambitious mission is to collect data about the planet's geology, mineralogy, climate, and history and distribution of water. In addition to providing insight into the red planet's past and present, the data will improve scientists' understanding of planetary climate change, in general. While other missions have shown that water once fl owed across the surface of Mars, scientists still do not know whether water remained long enough to provide a habitat for life. MRO will zoom in for extreme close-up photography of the Martian surface, analyze minerals, and look for subsurface water. Along the way, the spacecraft will look for resources, including water, that could support future human exploration. MRO carries six scientific instruments that will examine the surface, atmosphere, and subsurface in unprecedented detail from low orbit. The orbiter's high-resolution camera will reveal surface features as small as a dishwasher. NASA expects that together, the instruments will obtain several times more data about Mars than all previous Martian missions combined. Human beings always have pondered the question, "Are we alone?" Medieval scholars speculated that other worlds must exist and that some would harbor other forms of life. In recent years, advances in science and technology have brought scientists to the threshold of finding an answer to this timeless question, and the recent discovery of numerous planets orbiting stars other than the Sun confirms that Earth's solar system is not unique. In fact, these "extra- solar planets" appear to be more common in the galaxy than ever expected, and with each discovery, scientists get a clearer understanding of the variety of planets in the universe and how and where Earth-like planets may form. Scientists recently discovered a new frontier in the search to find life outside the solar system: dying red giant stars may bring icy planets back from the dead. Once-frozen planets and moons may provide a breeding ground for life as their stars enter the last, and brightest, phase of their lives. Scientists hypothesize that when a Sun-like star expands into its red giant phase, it grows tremendously in size and brightness. Warm rays from the star reach out to a once-frozen and dead moon, and the solitary satellite's icy top layer quickly melts into liquid water that creeps across the surface and fills old craters with warmer seas. This sets the stage for the birth of new life in the moon's now-vibrant oceans. Previous ideas about the search for extra-solar life had excluded these regions, but an international team of astronomers now estimates that the emergence of new life on a planet is possible within the red giant phase. One of the secrets of Earth's success in producing life is its location within the sphere of the Sun's "habitable zone." This donut-shaped boundary outlines where water can exist as a liquid in the solar system-a necessary component for the development of life. As the Sun develops into old age, its habitable zone will expand with it, changing the locales where liquid water-previously frozen as ice-can melt and provide a place where life may one day thrive. Lying just inside the outer limit of the Sun's habitable zone, Mars remains a frozen world because of its thin atmosphere. However, when the Sun becomes a red giant a few billion years from now, Mars may come alive. Currently, there are at least 150 red giant stars within 100 light years of Earth, and many of them may have orbiting planets capable of supporting life. Moons circle planets, and planets circle stars. Now, with the help of NASA's Spitzer Space Telescope, astronomers believe that planets also may circle celestial bodies almost as small as planets. This year, Spitzer continued to help scientists understand the complex and unusual circumstances under which Earth-like planets arise when it set its infrared eye on an extraordinary low-mass brown dwarf called OTS 44 and spotted a dusty swirling disk of planet-building material. A brown dwarf is a cool or "failed" star that lacks the mass to ignite and shine like the Sun. At only 15 times the mass of Jupiter, OTS 44 is the smallest known brown dwarf to host a planet-forming, or protoplanetary, disk. Scientists believe that this unusual system eventually will spawn planets. If so, they speculate that OTS 44's disk has enough mass to make one small gas giant and a few Earth-sized rocky planets. 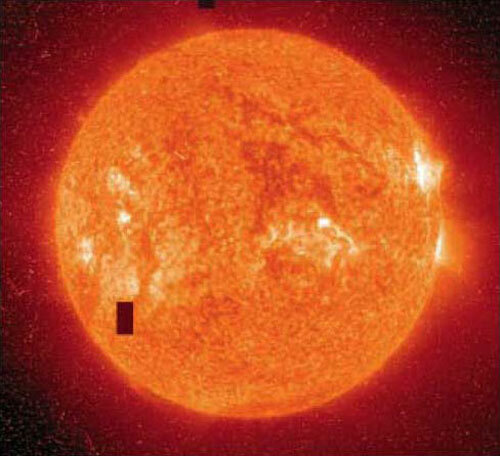 In fact, scientists now believe that there may be a host of miniature solar systems in the universe. When scientists search for planets outside the solar system, they do not try to spot the planet itself. Instead, they search for "wobble," the slight movement detected within distant starshine that indicates that the gravitational field of a planet is tugging on its parent star. Or, they search for a sign of "transit," the slight blip in the starshine that occurs when a planet passes in front of a star. Thanks to the Spitzer Space Telescope, scientists have another way to spot an extrasolar planet. For the first time, Spitzer captured the light reflected off two known planets orbiting far-away stars. This marks a new age of planetary science in which extrasolar planets can be directly measured and compared. According to two studies published in 2005, Spitzer directly observed the warm infrared glows of two previously detected "hot Jupiter" planets, designated HD 209458b and TrES-1. Hot Jupiters are distant gas giants that zip closely around their parent stars. From their orbits, they soak up enough starlight to shine in infrared wavelengths. To distinguish the planets' glow from that of their fiery host stars, the scientists used Spitzer to collect the total infrared light from both the stars and planets. Then, when the planets dipped behind the stars as part of their orbits, researchers measured the infrared light coming from just the stars. This pinpointed exactly how much infrared light belonged to the planets. Scientists announced on July 29, 2005, that they found another planet at the outer region of Earth's solar system. The research team, which included Mike Brown of the California Institute of Technology, Chad Trujillo of the Gemini Observatory at Mauna Kea, Hawaii, and David Rabinowitz of Yale University, in Connecticut, first spotted the distant object with the Samuel Oschin Telescope at Palomar Observatory in 2003. However, the object was so far away that its motion, and its true planetary nature, went unnoticed until the team reanalyzed the data in January 2005. After they realized what they had found, they restudied the planet for a better estimate of its size and motions. The planet is a typical member of the Kuiper belt, which is populated by a multitude of small, rocky bodies. But, the newly discovered planet is much larger. "Even if it reflected 100 percent of the light reaching it, it would still be as big as Pluto," said Brown. "I'd say it's probably one and a half times the size of Pluto, but we're not sure yet of the final size." What the team does know for certain is that the planet is about 97 times farther from the Sun than Earth, making it the farthest-known object in the solar system. It also is the third brightest of the Kuiper belt objects. The team has submitted a name for the new planet to the International Astronomical Union, which is responsible for selecting the names of planets, stars, and small bodies like comets. With the help of the Spitzer Space Telescope, scientists have detected organic molecules in galaxies dating back to a time when the universe was young. These large, complex molecules, known as polycyclic aromatic hydrocarbons, are made up of carbon and hydrogen and are considered by scientists to be among the building blocks of life. They are common on Earth and form any time carbon-based materials are not burned completely. They are found in sooty exhaust from cars and in charcoal-broiled hamburgers and burnt toast. They are pervasive in galaxies like the Milky Way, playing a significant role in star and planet building. However, Spitzer is the first telescope to see these molecules so far back in time- when the universe was one-fourth of its current age of about 14 billion years. "This is 10 billion years further back in time than we've seen them before," said Lin Yan of the Spitzer Science Center in California, lead author of a study on the subject published in the August 10, 2005, issue of Astrophysical Journal. Since Earth is only four-and-a-half billion years old, these organic molecules existed in the universe well before Earth and the solar system were formed. In fact, they may have been included in the seeds of the solar system. A look up at the night sky reveals an image of space that seems serene and quiet. This glimpse of the universe is deceptive. Space is filled with drama: creation, struggles, explosions, and death. As NASA's observation spacecraft watch, the dynamic universe is brought to Earth. On November 15, 2004, NASA launched the Swift spacecraft to observe gammaray bursts, the most powerful explosions the universe has seen since the Big Bang. Less than a month later, Swift observed three bursts in one day while the research team was still calibrating the main instrument, the Burst Alert Telescope. The bursts, which lasted less than a minute, likely signaled the birth of a black hole in Cygnus X-1, a bright source that produces gamma-ray bursts in the Milky Way galaxy. The team believes that the black hole formed in orbit around a star. Swift is the first spacecraft dedicated to studying, and discovering the source of, gamma-ray bursts. It is a multi-wavelength observatory carrying instruments that can view the universe in the X-ray, ultraviolet, and optical ranges. Its Burst Alert Telescope is the most sensitive telescope ever fl own in its particular spectral band. Even with these extra capabilities, the Swift team only expected to spot a couple of bursts per week, not three in one day. Researchers agreed: this is going to be an exciting mission. Later in December 2004, the universe put on another light show - a flash of light from across the galaxy so powerful that it bounced off the Moon and lit up Earth's upper atmosphere. The flash, a "giant flare" from an exotic, magnetically powered neutron star called a magnetar, was more intense than anything ever detected from beyond this solar system. Lasting over a tenth of a second, the flare caught the "eye" of Swift, NASA's RHESSI spacecraft, and many ground-based radio telescopes. The light was the brightest in the gamma-ray energy range, far more energetic than visible light or X-rays and invisible to the human eye. Such a close and powerful eruption raised the question of whether an even larger burst of gamma rays disturbed Earth's atmosphere, causing one of Earth's mass extinctions hundreds of millions of years ago. Also, if giant flares can be this powerful, then some gamma-ray bursts, originally thought to come only from very distant black holeforming star explosions, actually could be from neutron star eruptions in nearby galaxies. A neutron star is the core that remains of a star that was once several times more massive than the Sun. When these stars use up their nuclear fuel, they explode in an event called a supernova. The remaining core is dense, like the mass of the Sun mashed down to a ball about 15 miles in diameter, fast spinning, and highly magnetic. Millions of neutron stars fill the Milky Way galaxy. Of these, scientists have discovered only about a dozen ultrahigh- magnetic magnetars. The December 2004 flare, which originated in the vicinity of the constellation Sagittarius, produced more energy than the Sun emits in 150,000 years. Four of the identified magnetars are called soft gamma repeaters because they flare up randomly and release low-energy gamma rays. In the 1980s, a scientific debate raged over the source of gamma-ray bursts, but by the 1990s, data indicated that gamma-ray bursts originate very far away as neutron stars explode and that soft gamma repeaters form differently. The December 2004 event reopened the debate. From this event, scientists determined that short gamma-ray bursts could come from soft gamma-ray repeaters up to 100 million light years from Earth. Long gamma-ray bursts appear to be from black hole-forming star explosions billions of light years away. In May 2005, NASA scientists, for the first time, detected and pinned down the location of a short gamma-ray burst lasting only 50 milliseconds. Scientists finally may have the data they need to solve the mystery behind short gamma-ray bursts. The burst was likely the result of a collision between two black holes or neutron stars, forming a new black hole. Despite how violent this sounds, theory predicts that such collisions produce short afterglows because they have little fuel-dust and gas-either from the colliding objects or the surrounding area to feed on. The burst appears to have originated only about 2.7 billion light years from Earth, supporting the theory that short gamma-ray bursts come from older, evolved neutron stars and black holes relatively close to home. The afterglow of a burst contains the information scientists need to figure out what caused a burst. Before Swift was launched, short bursts were too fast for detailed observation. Swift's X-ray telescope detected a weak afterglow that faded away after about five minutes. Its ultraviolet/optical telescope saw nothing. Ground-based telescopes did not detect the afterglow. In contrast, afterglows from long bursts linger from days to weeks, providing ample opportunity to study them with a variety of telescopes. Mystery solved? It is too soon for scientists to say, but thanks to Swift and other observing spacecraft, the answer likely will come soon. While scientists puzzled over a flashy magnetar in the Milky Way galaxy, a supermassive black hole in a distant galaxy cluster called MS 0735.6+7421 asserted itself as the most powerful eruption in the universe. On January 5, 2005, NASA's Chandra X-ray Observatory spotted hot, X-ray-emitting gas caused by a gravitational energy release as a supermassive black hole sucked down the equivalent mass of about 300 million Suns from a surrounding galaxy cluster. Most of the matter was swallowed, but some of it was ejected before being captured by the black hole. The resulting eruption, which has lasted for more than 100 million years, has generated the energy equivalent to hundreds of millions of gamma-ray bursts. Scientists are not sure where such large amounts of matter came from. One theory is that gas from the host galaxy cluster cooled catastrophically and was swallowed by the black hole. The energy released shows the black hole has grown dramatically during the eruption. Previous studies suggest that other black holes have grown very little in the recent past and that only smaller black holes are still growing quickly. "This new result is as surprising as it is exciting," said Paul Nulsen, scientist at the Harvard-Smithsonian Center for Astrophysics in Cambridge, Massachusetts, and co-author of the study about the discovery, published in the January 6, 2005, issue of Nature. "This black hole is feasting, when it should be fasting." Swift ended FY 2005 by spotting the most distant explosion yet, a gamma-ray burst from the edge of the visible universe. The September 4 burst, which likely marked the death of a massive star as it collapsed into a black hole, originated about 13 billion light years from Earth-back in an era soon after stars and galaxies first formed, about 500 million to one billion years after the Big Bang. Scientists have spotted only one other object, a quasar, at a greater distance. However, quasars are supermassive black holes containing the mass of billions of stars, whereas a gamma-ray burst comes from a single star. Scientists now are studying how a single star could generate so much energy as to be seen from across the universe. Swift was the first, but not the only, instrument watching this unusual burst. Swift detected the burst, called GRB 050904, and relayed its coordinates around the world within minutes. Scientists on four continents eagerly tracked the burst and its afterglow as it gradually faded over several days. The community heralded the discovery as a major breakthrough in the study of the early universe. Despite exhaustive searches, scientists have spotted relatively few quasars or other phenomena from the distant, ancient reaches of the universe. Based on Swift's numerous discoveries since its launch in 2004, scientists hope that gamma-ray bursts, including very distant bursts, are plentiful. If so, Swift will be the premier way to study the early universe. 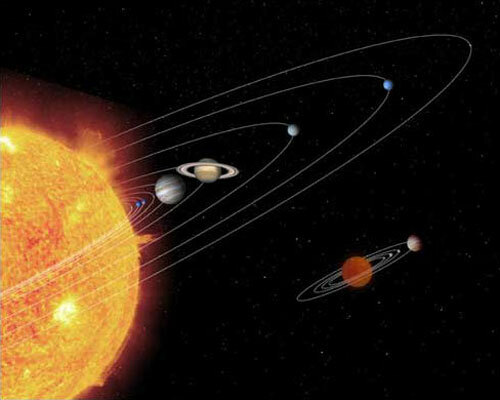 The solar system is surrounded by a bubble-shaped area called the termination shock, where the solar wind, a thin stream of electrically charged gas blowing continuously outward from the Sun, is slowed by pressure from gas outside the solar system. Voyager 1, which started its journey more than 26 years ago by investigating Jupiter and Saturn, burst through that bubble in May 2005 and entered into the solar system's final frontier. Voyager is now flying through an area beyond the termination shock known as the heliosheath, a region created by the interstellar winds that blow past the protective shell of the solar system's heliosphere. During the spacecraft's trip through the edge of the solar system, it found some surprises that revealed new information about the Sun and its interaction with the rest of the galaxy. Scientists expected the solar wind beyond the termination shock would slow down. But Voyager sent back data that said the speed was much slower than expected, and at times the solar wind appeared to be flowing back inward toward the Sun. Researchers believe this could be related to the highs and lows of the Sun's 11- year cycle of sunspot activity. Perhaps the most puzzling surprise is what Voyager did not find at the shock. Scientists predicted that interstellar ions would bounce back and forth across the termination shock, slowly gaining energy with each bounce to become high- speed cosmic rays. Because of this, scientists expected those cosmic ray ions would become most intense at the shock. 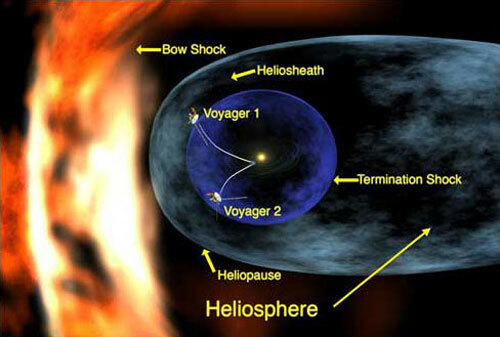 However, the intensity of the cosmic rays has steadily increased as Voyager moves farther beyond the shock. 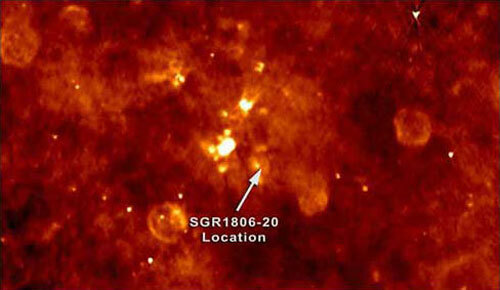 This means that the source of those cosmic rays is in a region of the outer solar system yet to be discovered. As Voyager leaves the solar system, it ventures into new territory-interstellar space-that has only been glimpsed by telescopes. The spacecraft, which could survive the dark, cold reaches of space until 2020, will continue to make amazing discoveries.